It's been so long since we last had tacos that we were craving them really badly. We had no real set plan as to what our tacos would be; things just fell into place. Usually, I poach pork shoulder with onions, Mexican oregano, epazote and bay leaves. When the pork is tender, we shred and then crisp in the oven. This time, however, we did not have time to poach pork shoulder for more than a couple of hours. So, I took this opportunity to try a different method of doing carnitas, after Diane Kennedy by way of Jude at Apple Pie, Patis, and Pâté (Jude's Carnitas recipe). With a hunk of pork shoulder cut into smallish cubes, I added enough water to let them braise uncovered in a pan until tender. I spotted some pineapple chunks in the fridge, so I figured I might as well add these to the pork. When they are the desired tenderness, I turned up the heat to let the rest of the water evaporate and for the cubes to start crisping up. I did not want to wait for my tomatoes to drain for making salsa, so I figured I'd do a roasted salsa instead. Admittedly, that somewhat fuzzy logic only makes sense when run through our own calculus of laziness and impatience. And a dull knife. 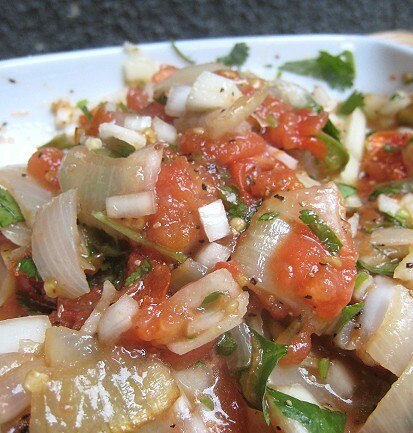 I figured I can get away with rougher cuts of tomatoes and onions in a roasted tomato salsa than a fresh pico de gallo. My roasted salsa consisted of tomatoes, onions, garlic and jalapeño peppers. After approximately 30 minutes in the oven, we threw them together with some lime juice and cilantro, and seasoned the whole lot. Besides, my fuzzy logic yielded the added bonus of baked sweet potatoes at the end of this roasted tomato salsa path. 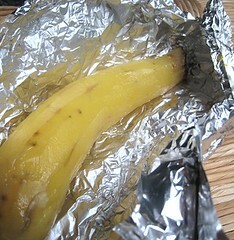 Given that the oven was already on, I just peeled a couple of sweet potatoes, wrapped them in foil, and threw them in the oven. I figured the kids would like sweet potato like candy. We also made the required accompaniments of chopped onions and cilantro, lime wedges, and threw in some chopped jalapeños as well. We had there a corn tortilla, the pineapple carnitas, our roasted salsa, chopped jalapeños, and of course, onions and cilantro, with a squeeze of lime. The sweet potatoes were intended for the kids, but they did not even want to try it! Anyhoo, it was their loss, because these simply-baked sweet potatoes were so sweet and so good. I'm quite amazed, because the sweet potatoes were not even seasoned at all! As I was working my way through a whole sweet potato -- as a snack before tucking into the tacos, mind you -- I had the idea of adding chunks of it to my tacos. The tacos with the pork, the roasted salsa, condiments and the sweet potato chunks were delicious! After TS switched tack from snack to entrée, I had to try the sweet potato taco. Surpisingly, the sweet potatoes went very well with the flavours of the roasted salsa, their mellow sweetness tempering the punchy spiciness of the chiles. In fact, it might be quite blasphemous to say, but I seem to remember enjoying the sweet potato taco better than the carnitas taco. Or was it because I only had the sweet potato taco? Perhaps the carnitas were all gone? Hm, I know some family members had the carnitas with rice, so there was not plenty to go around. Doing the pork shoulder in chunks also cuts down on the final volume of the dish: they go quicker when they're in chunks rather than shreds. 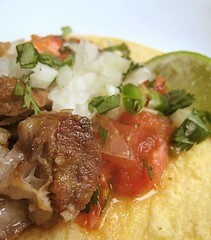 I still am ambivalent about which carnitas way I prefer, so maybe it is time to have another tacos de carnitas night. 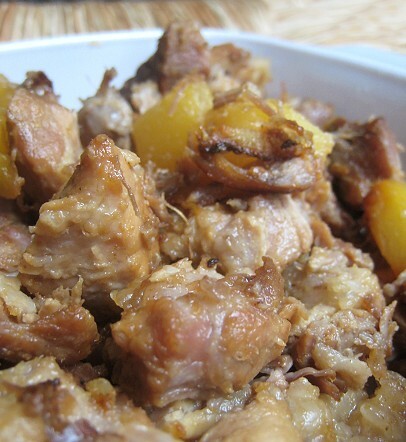 I love the use of pineapple with your carnitas to add some sweetness! I love carnitas and I love the addition of pinepple. Yum! 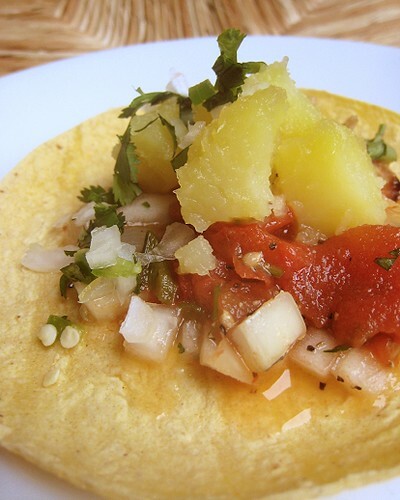 Pineapple carnitas sound so good! Great idea! 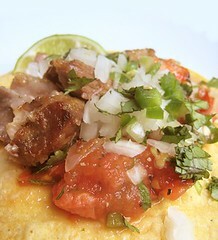 These look outstanding - carnitas sound soooo good right now. I'm going to have to check out Jude's recipe, I haven't seen that one yet. His are always a winner. A nice twist! Pineapple and sweet potato make this very interesting. I didn't expect the pineapples but I'm certainly not complaining! I love pineapples. Carnitas is the way to go! What?! What?! How can you not like sweet potatoes!? These were like CANDY, I tell you. CANDY! Thanks! But yes, doing it his way takes less time than what we usually do. Thanks! I guess we added two times the sweetness to the tacos. 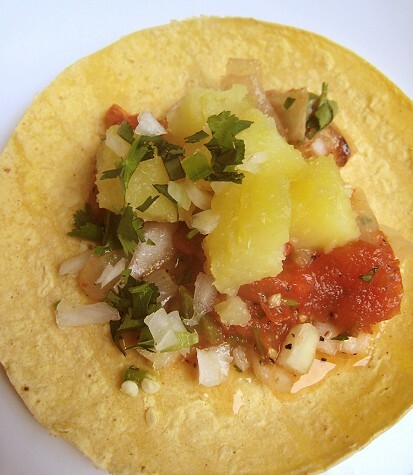 Everything sounds delicious but that those pineapples sound like a great addition into the carnitas. Oh yeah, I love pineapples so for me, it definitely added something "extra"!